We are pleased to host this new film with Richard Gage, AIA, in person. We hope you will join us and bring a friend or two! 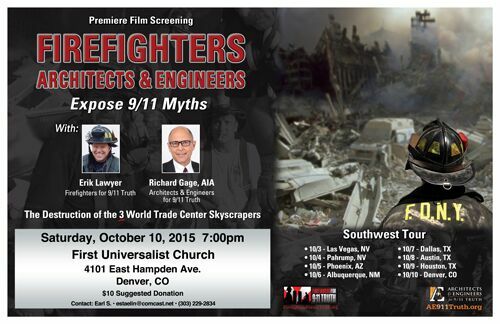 Richard Gage, architect (AIA) for over 20 years, founder of Architects and Engineers for 9/11 Truth, will be in Denver to present the new 97-minute film Firefighters, Architects, & Engineers Expose 9/11 Myths. The film includes Erik Lawyer, senior firefighter and founder of Firefighters for 9/11 Truth, and Richard Gage sharing the platform, both contributing to a multimedia slide presentation — laying out the evidence of what really happened at the WTC and exposing two dozen myths about the WTC building collapses. (2) refusing to consider the eyewitness testimony by 118 NYC Fire Department firefighters that they observed bombs and explosives going off before and as the WTC buildings collapsed. This presentation is part of a Southwest tour by Richard Gage to present the film and evidence, followed by discussion. This tour started as a result of the acceptance of the booth of Architects and Engineers for 9/11 Truth at the “Structural Engineering Summit” at the Red Rock Casino in Summerlin, Nevada, near Las Vegas on Oct. 1-2, 2015. AE 9/11 Truth will be exhibiting primarily the World Trade Center Building 7 (WTC 7) evidence to the hundreds of structural engineers in attendance. That will be followed by a Las Vegas public speaking engagement on Saturday, Oct. 3. Richard Gage has 20 years’ experience as an architect. He has obtained the signatures of over 2,350 architects and engineers calling for a new investigation of the destruction of the WTC based upon the evidence that the twin towers and WTC 7 (a 47-story skyscraper) were brought down by controlled demolition. Richard has given live multimedia presentations — 9-11: Blueprint for Truth and 9-11: Explosive Evidence — Experts Speak Out — in 35 foreign countries around the world. The latter was one of the most-watched programs ever to appear on National PBS. This event is sponsored by Colorado 9/11 Truth, the Community Forum of the First Universalist Church of Denver, and We Are Change Colorado. Contacts: Frances Shure, franshure@estreet.com and Earl Staelin, estaelin@comcast.net. Architects and Engineers for 9/11 Truth, FAE Expose 9/11 Myths, Firefighters for 9/11 Truth, Movies/DVDs, Richard Gage AIA, Special Events. permalink.